“Family-based immigration” doesn’t sound as scary — or get at the fear of losing control. Over the course of President Donald Trump’s first year in office, his administration’s top immigration priority has shifted subtly. He’s talking less about deporting “bad hombres” and talking more — a lot more — about how “chain migration” is bad for the United States. In September, Democratic leaders assured 800,000 young immigrants that they would make use of their leverage in year-end spending battles to pass a clean Dream Act. On Thursday, Democrats folded on this promise without much of a fight, allowing a continuing resolution to pass both houses of Congress and heading home for the holidays while leaving thousands of immigrants in "legal limbo." An alarming trend along the U.S.-Mexico border has escalated within the last year: the inhumane practice of separating immigrant children from their parents at the hands of U.S. immigration officials. Not only is this practice deeply traumatic for the families involved, it flies in the face of established U.S. and international law. The Washington Post reports that the Department of Homeland Security (DHS) is again considering former department head John Kelly’s proposal to separate Central American children from their parents, supposedly in order to deter a “surge” in entries by asylum seekers. In November, 7,018 families were detained at the southwestern border, a 45 percent increase over October's figure; the number of “unaccompanied alien children” rose by 26 percent. 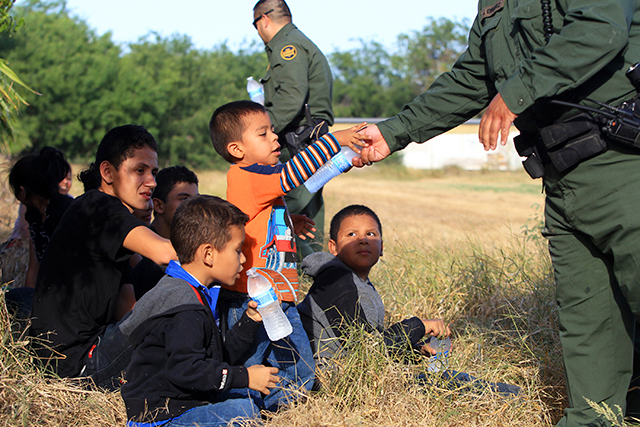 The families and unaccompanied children were largely from El Salvador, Honduras, and Guatemala. 1. Republicans blamed the Obama administration for a similar uptick in entries by Central American families and children during the first half of 2013. The claim then was that Obama policies such as DACA encouraged the increase. Now we have a new uptick following Trump’s decision to end DACA. Are Republicans going to say the Trump administration is too soft on immigration? 2. Is there really a “surge,” or is this just deferred immigration? Entries were significantly down at the beginning of the year as potential immigrants waited to see how bad the Trump policies might be. Have people who put off the journey back then now decided they can’t wait any longer? 3. What are factors in the main sending countries that might have pushed more people to leave in November? For example, Honduras was to hold elections at the end of the month. Many people might have left because they feared that violence would break out during the election period—as actually happened. 4. Much of the violence in the sending countries is connected to the drug trade. The U.S. has been engaged in a so-called “war on drugs” since the Nixon administration, including military aid to Central American countries. The results haven’t been encouraging: U.S. drug overdose deaths rose from less than 10,000 in 1980 to about 64,000 in 2016. Why aren’t we reconsidering our militarized strategy for curbing drug abuse? 5. Two of the three sending countries—Honduras and Guatemala—happen to be among the nine countries that supported the United States in a December 21 UN General Assembly vote on Trump’s decision to move the U.S. embassy from Tel Aviv to Jerusalem. On November 28 the Trump administration certified the Honduran government’s record on human rights, and on December 22 the administration recognized the Honduran regime’s widely disputed “victory” in the November elections. Isn’t it interesting that so many people are fleeing countries whose governments seem to be so close to the current White House? 6. Is the increase in entries by a few thousand children and families really a serious crisis? More than 200,000 U.S. citizens have moved from Puerto Rico to Florida alone since hurricane Maria struck their homes in September. Why does this large increase in the mainland population get comparatively little attention? Is it because it highlights inadequacies in the Trump administration’s relief efforts for Puerto Rico, or because it might focus attention on climate change denialism in the White House? The Postville Boss Gets Out of Jail. What About His Immigrant Workers? On December 20 President Trump commuted the 27-year prison sentence of former kosher meatpacking magnate Sholom Rubashkin for bank fraud. Rubashkin had headed the Agriprocessors Inc. company, whose plant in Postville, Iowa, was the scene of a massive military-style workplace raid in May 2008. 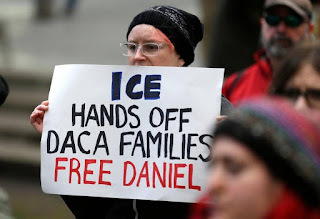 Federal agents arrested 389 immigrant workers, including 18 ranging in age from 13 to 17; most of the detained workers spent five months in prison on charges related to their immigration status and were then deported. The raid took place as the United Food and Commercial Workers (UFCW) was trying to organize the plant. President Trump on Wednesday commuted the prison sentence of Sholom Rubashkin, whose Iowa meatpacking plant was the target of a huge immigration raid in 2008, and whose 27-year prison sentence angered many Orthodox Jews. How the DACA deadline actually works — and why Trump and Congress can’t just punt on it. Congress is moving to clear off most of its urgent business before leaving for the holidays, with one exception: a bill that would address the 690,000 unauthorized immigrants protected from deportation under the Deferred Action for Childhood Arrivals program. GOP leadership has refused to concede it was a priority. And Democrats — for whom a DACA fix once seemed important enough to withhold votes on key spending bills, potentially risking a government shutdown on Friday — appear to be backing down. 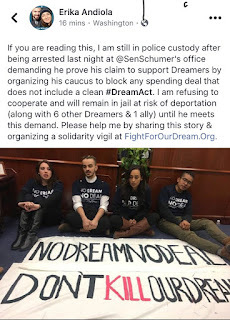 A group of Dreamers -- including a former Bernie Sanders' presidential campaign staffer, Erika Andiola -- have been on a hunger strike since they were arrested Friday after a sit-in at the Capitol, at the office of Senate Minority Leader Chuck Schumer. The Dreamers are vowing to continue their hunger strike until Schumer and GOP Rep. Carlos Curbelo, R-Florida win enough votes in the Senate and the House to delay a vote on the spending bill and force a vote on a clean DREAM Act. They're pushing for a vote on such a bill on Dec. 22, the date when lawmakers must pass a new spending bill in order to avert a government shutdown. 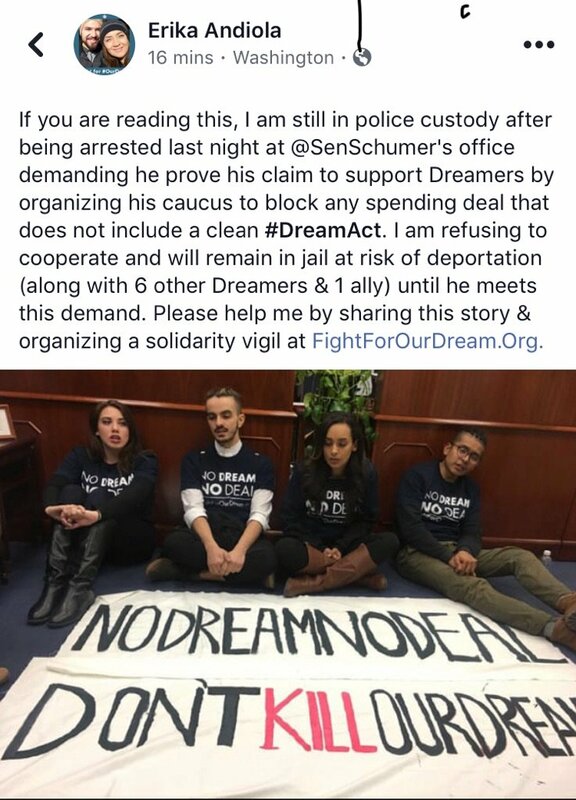 A group of Dreamers claim to have gone on hunger strike in a Washington, D.C., jail until Congress commits to forego passing an end-of-the-year spending bill without a "clean" DREAM Act. 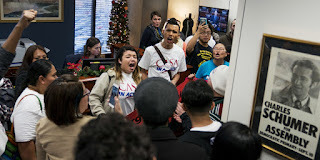 Last night, seven DACA recipients were arrested on Capitol Hill demanding that Congress pass a clean Dream Act as part of the year-end spending bill. 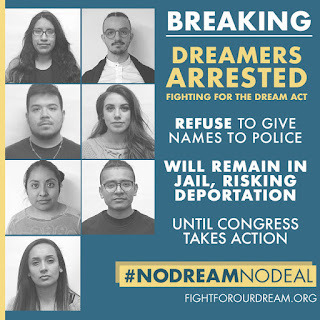 Erika, Belen, Cata, Hector, Barbara, Li and Juan Carlos are now in custody and are refusing to identify themselves — attempting to remain in jail — until Congressional leaders confirm that they will block any spending bill without protection for DREAMers. This is a powerful demand and an unprecedented sacrifice from undocumented youth that needs to be amplified and supported across the country! Will you help? This is urgent. We have until December 22nd to ensure Congress passes a clean Dream Act and grants permanent protection to undocumented youth as part of the spending bill. And with brave DACA recipients risking deportation in D.C., we are building the momentum to make that possible! From December 18th-22nd, undocumented immigrants and allies will be taking action in Washington, D.C. and around the country. Can you join an action or organize an action near you? More than 3 months have passed since the White House repealed DACA, and Congress says there’s no urgency to act by the end of the year. But every day the Dream Act does not pass, undocumented youth are at risk of detention and deportation. Thousands have already lost their work permits, jobs, and sense of safety. Right now in Washington, D.C., DACA recipients are making a deep sacrifice — staying in jail and risking deportation — as a call to action to the nation. Will you heed their call? This is the moment to stand firmly with undocumented immigrants. Please join us in D.C. or attend an action near you. December 18th is the 7th anniversary of when the original Dream Act died in the Senate. The #OurDream alliance is 10 years in the making. We have a real opportunity to make 2017 the year that the Dream Act finally passes. But to win, we need to make tons of noise and demand #NoDreamNoDeal. All the politicians who claim to “stand with the DREAMers” must do more — they must commit to rejecting any spending bill that does not include the Dream Act. 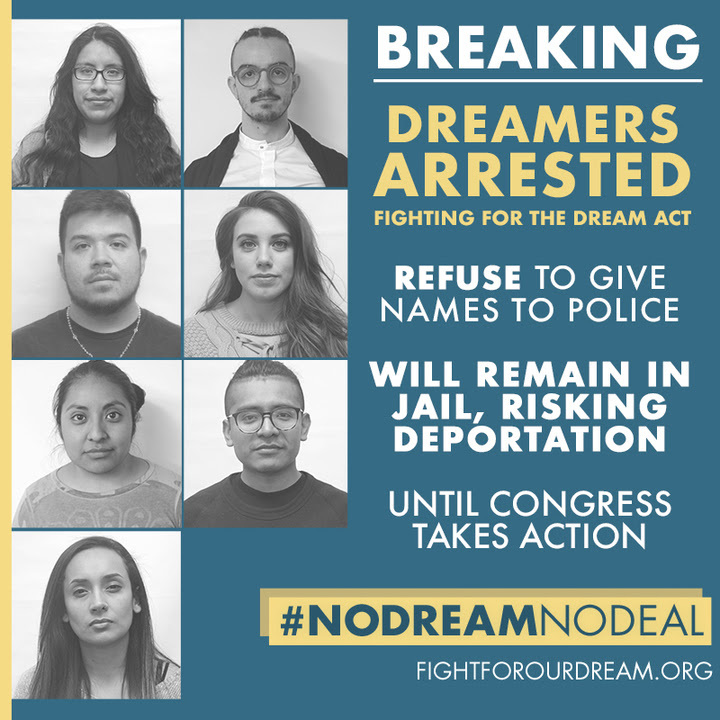 The plan is that Erika, Belen, Cata, Hector, Barbara, Li and Juan Carlos will refuse to identify themselves — attempting to remain in jail — until Congressional leaders confirm that they will block any spending bill without protection for DREAMers. 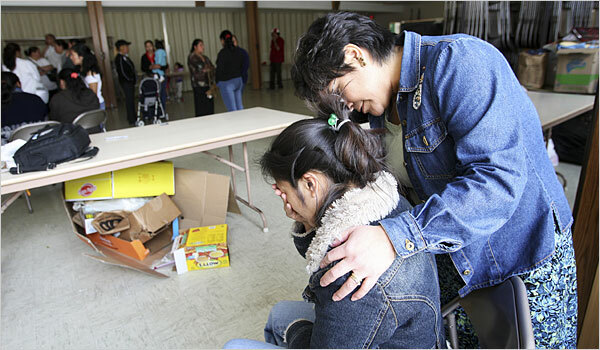 Courageous, undocumented youth are taking on tremendous risk. Can we count on you to get out there and support them? Thank you for all you do and ¡adelante! – Matt, Favianna, Erick, Reetu, Oscar, Erica and the Presente Action team. Are Democrats Deserting the Dreamers? Update, 12/15/17: Osman Enriquez was released from detention on December 14, following the publication of the Vox article on his case the day before. Exclusive: the Postal Service kept him from renewing his DACA. Now he’s in immigration detention. Pennsylvania father Osman Enriquez was waiting for a letter telling him to reapply. A former DACA recipient who was waiting to reapply for deportation protections, after his initial application was rejected due to postal service delays, is currently in the custody of Immigration and Customs Enforcement in Pennsylvania, Vox has exclusively learned. On November 28, Immigration and Customs Enforcement (ICE) agents collaborated with court officers and administrators to detain a public defender’s client at the Brooklyn Misdemeanor Court. In response, dozens of public defenders marched out, demanding that Chief Judge Janet DiFiore and the Office of Court Administration implement policies to prevent New York courthouses from collaborating with ICE. 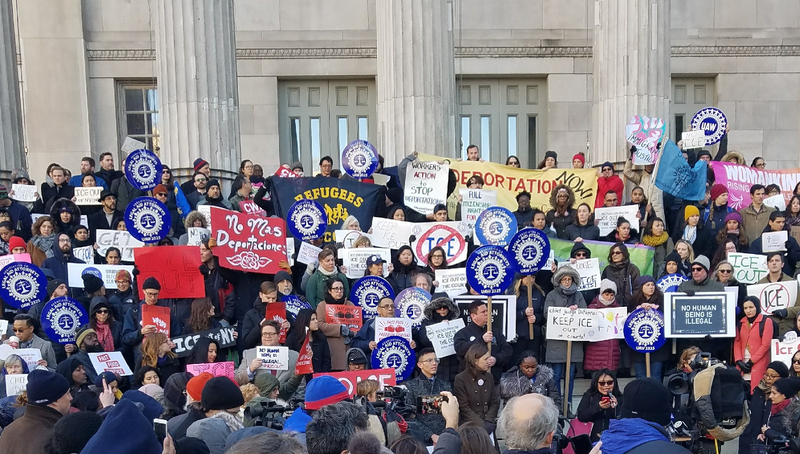 This is the seventieth time this year that federal agents have detained undocumented immigrants at New York courthouses as they perform their civic duties. It's time to turn up the pressure on Chief Judge DiFiore and make our voices heard. Send her a letter demanding she bars ICE from courthouses NOW! A Border Patrol agent shot an apparent border crosser dead on November 29 in the Tohono O’odham Native American Nation, which has had many problems with the Border Patrol in the past. The government promised an investigation of the latest shooting, and the incident quickly dropped out of the news. In contrast, Kate Steinle’s tragic death continues to get media coverage—it’s become an argument for Trump’s border wall, even though it had absolutely nothing to do with failures in border security. In Arizona, a Border Patrol agent shot and killed an undocumented migrant in a remote mountainous region on the Tohono O’odham Nation on Wednesday. The shooting occurred about 20 miles away from the U.S.-Mexico border. The chief of the U.S. Border Patrol’s Tucson sector is claiming, without evidence, that the shooting occurred after the man grabbed the gun of one of the agents. Migrant justice groups are demanding the killing be investigated. [C]alls to name Trump’s intended border fortification “Kate’s wall”… would make it the world’s largest free-standing non sequitur. 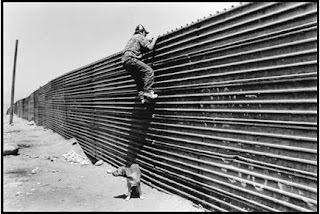 Garcia Zarate’s presence in the United States does not prove the weakness of our border security. Just the opposite. Instead of smuggling heroin through ports of entry or across the border, the cartel’s traffickers exploited weaknesses in border security: parcels shipped through the mail, UPS and FedEx; air cargo; and travel on transit systems with relatively little security, like Amtrak. Hate is profitable for the Mercers, BlackRock, JPMorgan Chase, and Wells Fargo. On November 29, 2017, Border Patrol agents from the Tucson Sector shot and killed a migrant in a remote region of the Baboquivari mountains on the Tohono O’odham Nation. 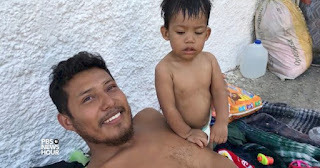 Rodolfo Karisch, Chief Patrol Agent of the Border Patrol’s Tucson Sector, justified the killing, saying that after two agents chased and tried to detain a group, one individual became “assaultive.” There is no independent corroboration of this version of events. We recognize this as murder, and part of a larger trend of Border Patrol acting with impunity in remote desert regions. Border Patrol tactics of chase and scatter are violent and regularly result in death and disappearance. The shooting happened on Tohono O’odham land, high in the mountains, over 20 miles from the border. This is a direct result of border militarization where urban crossings have been sealed and internal checkpoints have been implemented, pushing people further into the mountains where agency accountability and oversight is impossible. We reject the categories of criminalization that puts every migrant and refugee in the borderlands directly in the crosshairs of Border Patrol sights. These boundaries and borders were drawn by the imposition of a white settler nation and US imperialism. Border enforcement is genocide. This impunity to kill will not go unchallenged. We demand the opening of investigations of the 55 people murdered directly by Border Patrol and we demand justice for all the victims and their families. No one deserves to die this way. We grieve this life, and all lives lost in the militarized borderlands. Coalición de Derechos Humanos / SOA Watch / Border Patrol Victims Network/ No More Deaths / Chukson Water Protectors / L.U.P.E. Action Committee / Alliance for Global Justice / PanLeft / Split Seeds Productions / Tuell Consulting / Tucson Showing up for Racial Justice (SURJ) / Casa Mariposa / Borderlinks / LUCHA / Spoken Futures / La Pilita / Observatorio de Derechos Humanos de los Pueblos / Soldepaz – Pachakuti / Red de Colectivos La Araña Feminista de Venezuela / Corriente Revolucionaria Bolívar y Zamora de Venezuela / Movimiento Agro Comunal Bolivariano de Venezuela / Comisión Multisectorial del Uruguay / Red de Integración Orgánica – Rio – Por la Defensa de la Madre Tierra y los Derechos Humanos de Guatemala / Confederación Nacional de Organizaciones Campesinas, Indígenas y Negras (FENOCIN) de Ecuador / Confederación Sindical Única De Trabajadores Campesinos de Bolivia (CSUTCB) / Stop the Wall /Palestinian Farmers Union / Palestinian New Federation of Trade Unions / Palestine Youth Forum / Association for Farmers’ Rights and for the Preservation of the environment / Women Center for Social Development / Association Jadayel / Palestinian Center for Culture, Arts and creativity / Palestinian Farmers Society-Tulkarem / Ni’lin Society for Development and Community Work / Popular Council to Protect the Jordan Valley / Movimiento Nacional del Poder Popular – México / Movimiento Nacional del Poder Popular Zacatecas / Movimiento del Magisterio Democrático Nacional, Comité Ejecutivo Nacional Democrático del Sindicato Nacional de Trabajadores de la Educación en Lucha (CEND del SNTE en Lucha) / Asamblea de los Pueblos en Defensa del Territorio, la Educación Pública, Laica, Gratuita y los Derechos Humanos / Frente de Pueblos en Defensa de la Tierra en San Salvador Atenco (FPDT-Atenco) / Consejo de Defensa de los Derechos del Pueblo (CODEP-MNPP) / Consejo de Organizaciones Interdisciplinarias Vinculadas por Oaxaca (COIVO) / Coordinación de Comunidades Indígenas de la Sierra Sur (COCISS) / Comité de Defensa Ciudadana (CODECI) / Contingentes del Comité Ejecutivo Nacional Democrático del SNTE en Lucha (CEND SNTE en Lucha) / Congreso Nacional de Bases / Movimiento del Magisterio Democrático Nacional: Sección III de Baja California Sur / Sección V de Campeche/ Sección X de la Ciudad de México / Sección XIII y XLV de Guanajuato / Sección XIV de Guerrero / Sección XV de Hidalgo / Movimiento Magisterial Jalisciense, Secciones XVI y XLVII de Jalisco / Sección XVIII de Michoacán / Movimiento Magisterial de Bases / Sección XIX de Morelos / Consejo Democrático Magisterial Poblano: Secciones XXIII y LI de Puebla / Movimiento Magisterial de Bases de Querétaro, Sección XXIV de Querétaro / Bases Magisteriales Democráticas de Quintana Roo, Sección XXV de Q. Roo / Bases Magisteriales de Tabasco, Sección XXIX de Tabasco, Trabajadores del Colegio de Bachilleres de Tabasco / Comité Estatal Democrático, Sección XXXII y LVI de Veracruz / Sección XXXVI del Valle de México / Consejo Nacional de Sistematización; Escuelas Integrales de Educación Básica de Michoacán / Colectivo Pedagógico “Francisco Javier Acuña Hernández” / Promotora del Poder Popular de Michoacán / Caja Popular de Ahorro “Emiliano Zapata” / Colectivo de Estudios “Ricardo Flores Magón” / Barzón Federación: Estado de México, Querétaro, Morelos, Veracruz, Guerrero y Distrito Federal / Organización Nacional del Poder Popular (ONPP) / Organización Nacional del Poder Popular de Morelos (ONPP-MORELOS) / Organización Nacional del Poder Popular del D.F. / Asamblea Permanente de los Pueblos de Morelos / Instituto Mexicano de Desarrollo Comunitario (IMDEC) / Centro de Atención en Derechos Humanos a la Mujer y el Menor Indígena (CADHMMI) / Centro Regional Indígena en Derechos Humanos “Ñuu-Savi” (CERIDH). 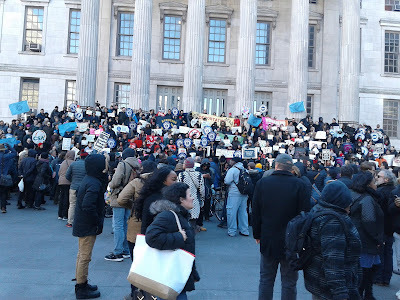 BROOKLYN, N.Y. (CN) – A week after public defenders staged a walkout in protest of immigration agents carrying out courthouse arrests, attorneys joined a throng of several hundred protesters Thursday on the chilly front steps of Brooklyn Borough Hall. 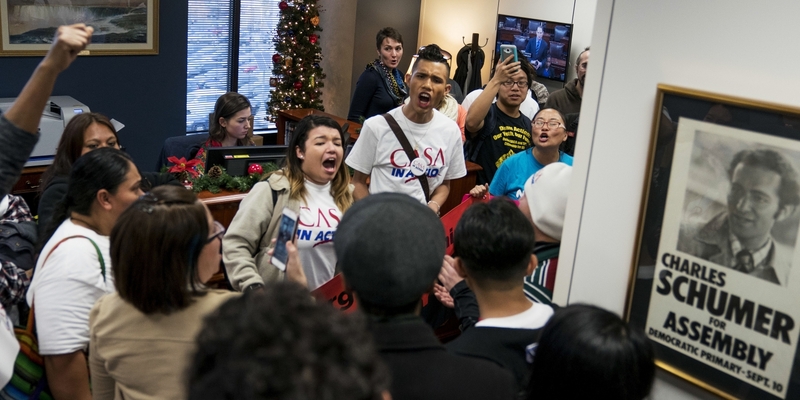 “Hey, hey, ho, ho, ICE has got to go,” they chanted, using the abbreviation for U.S. Immigration and Customs Enforcement that appeared in many of the home-made signs dotting the crowd. Resistance at Tule Lake Screens at the Austin Asian American Film Festival! Resistance at Tule Lake is having its Texas Premiere! JOIN US at the Austin Asian American Film Festival (AAAFF) where we are IN COMPETITION for Best Documentary Feature! 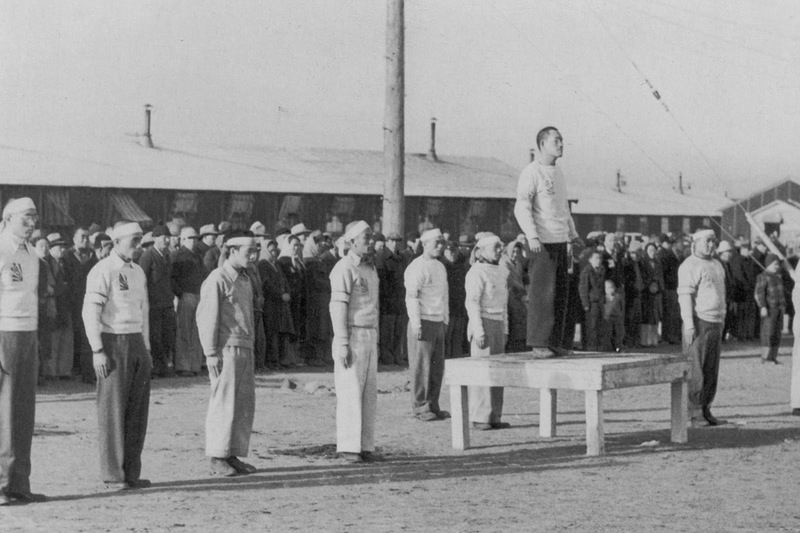 "While the dominant narrative of the mass incarceration of more than 110,000 Japanese Americans during World War II has been one of general cooperation, filmmaker Konrad Aderer (ENEMY ALIEN) explores the much-suppressed history of those who protested their unjust imprisonment. When forced to pledge their unconditional loyalty to the United States government, many refused. 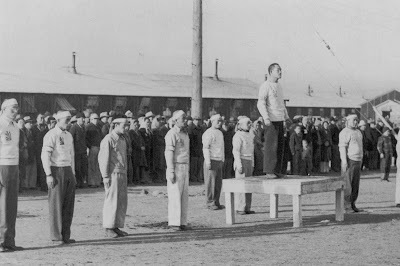 Some were deported to Japan, and over 12,000 were deemed “disloyal” and relocated to what came to be known as the Tule Lake Segregation Center, a militarized camp where resistant citizens faced further abuse and torture. Aderer combines rare historical footage with emotional oral histories from survivors and their descendants to uncover the overlooked stories of Japanese American citizens who protested racism, immigrant scapegoating, and white supremacy. RESISTANCE AT TULE LAKE sheds light on a dark period in American history and offers a reminder of the dangers of fear, hate, and the marginalization of immigrant and minority communities." *Screening preceded by short film Cliff, Superfan! 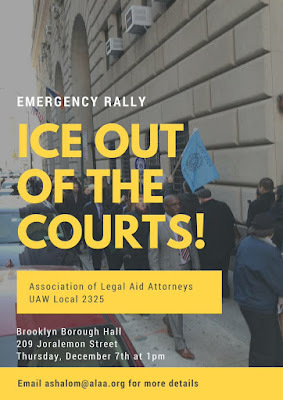 Emergency Rally, Brooklyn, 12/7/17: #ICEOut of the Courts Now! 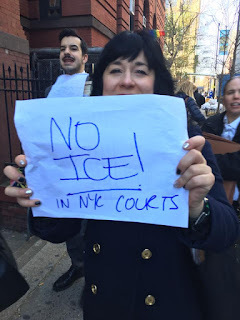 On Tuesday, dozens of public defenders walked out of Brooklyn Criminal Court after a Legal Aid client was detained by Immigration & Customs Enforcement in Brooklyn Criminal Court in collaboration with Court Officers and the Court Administration. 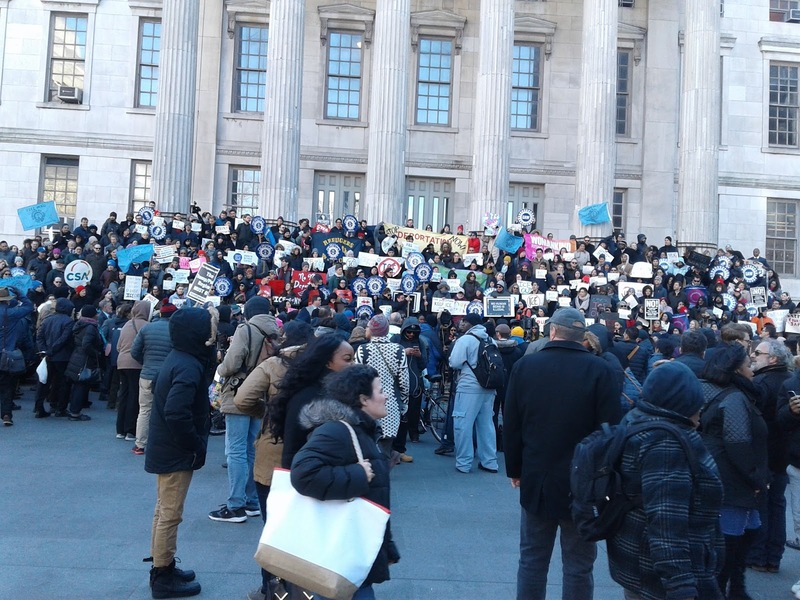 They marched to the Brooklyn District Attorney’s office, demanding that the Office of Court Administration and Chief Judge Janet DiFiore implement a policy to would prevent New York Court staff from collaborating with ICE officers or entering Court property. 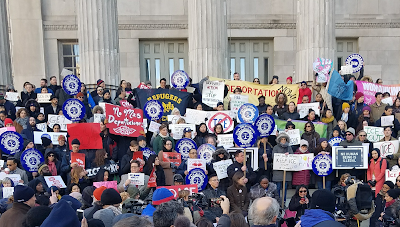 Please join us on Thursday, December 7th, at 1pm at Brooklyn Borough Hall for a mass rally with our union, other attorneys, and community and immigrant organizations to demand that the Office of Court Administration and Chief Judge Janet DiFiore implement a policy to bar ICE agents from entering NY Court property. Chaos erupted at Brooklyn Criminal Court Tuesday morning after agents with U.S. Immigration and Customs Enforcement snatched a defendant in the hallway, prompting a walkout by public defenders and accusations from court officers that Legal Aid attorneys had physically attacked them. Why Is ICE Arresting Immigrants in New York City’s Courts? Despite New York’s being a sanctuary city, ICE is prowling the courtrooms. 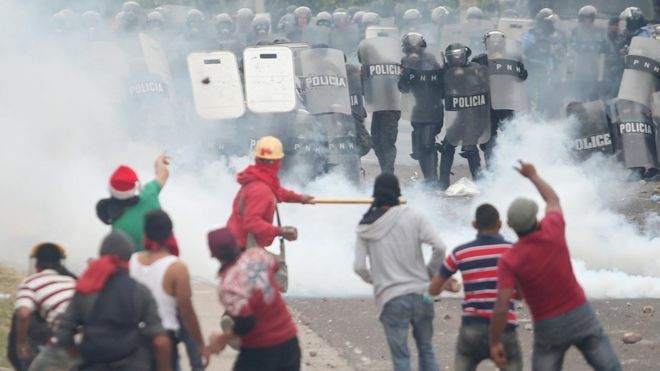 The news out of Honduras has taken dizzying turns since the Nov. 26 presidential election — some predictably sickening, but some so exceptional as to startle even veteran analysts of this Central American country. A partial recount of disputed ballots now puts the incumbent, Juan Orlando Hernandez, ahead by a whisker – after inexplicable halts and delays in the counting. After six days of deliberation, on November 30 a San Francisco jury acquitted Mexican immigrant José Inez García Zárate of murder and manslaughter charges in the July 2015 shooting death of Kate Steinle. Prosecutors said García Zarate (AKA Juan Francisco López-Sánchez and Francisco Sánchez) had purposely shot into a crowd of tourists, while the defense claimed the bullet, which hit Steinle on a ricochet, was fired accidentally. The jurors found the prosecution case open to reasonable doubt, although they convicted the defendant of felonious possession of a firearm. President Trump and rightwing propagandists like Ann Coulter had tirelessly exploited Steinle’s death as an example of violent crime by undocumented immigrants against U.S. citizens—and as a justification for border walls, mass deportations, and a cutoff of funds to so-called “sanctuary cities.” Naturally, the president and his supporters tweeted furiously against the jury’s decision. Sloppy media coverage of the case has tended to provide cover for Trump’s side. For example, there’s been almost no discussion of how a revolver fell into the hands of a homeless immigrant in San Francisco. An agent of the Bureau of Land Management had left the loaded weapon inside a car parked in a high-crime part of the city—a violation of BLM policy and an invitation to theft. It's not clear whether the BLM, an obscure federal agency, has disciplined the careless officer—or explained why its employees would ever need to carry arms. Meanwhile, media outlets repeat endlessly that García Zarate had seven felony convictions and was deported five times. Sources rarely mention that four of the convictions involved drug possession and the remaining convictions were for illegal re-entry of the U.S. None of the convictions were for violent crimes, although Trump and others dishonestly called the immigrant violent. García Zarate seems to be a mentally disturbed person with a drug problem; at one point a federal court recommended sending him to a medical facility. And if anything, his record of deportations should make people question the wisdom of shipping immigrants out of the country as a way to stop crime. They can come back, and no amount of border security guarantees that they won’t. Wouldn’t it have been better to keep García Zarate here and try to deal with his drug issues? A jury handed a stunning acquittal on murder and manslaughter charges to a homeless undocumented immigrant whose arrest in the killing of Kate Steinle on a San Francisco Bay pier intensified a national debate over sanctuary laws. So why is all the attention on an immigrant who was at the end of an unfortunate chain of events? San Francisco has become an anti-immigration punching bag in the wake of a grisly killing. But there’s little evidence that the city’s sanctuary law was to blame.